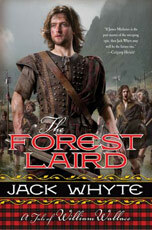 Scottish history buffs and fans of historical fiction will have no trouble immersing themselves in The Forest Laird: A Tale of William Wallace, the first novel in the new Guardians Trilogy by Jack Whyte. The bestselling author of the Dream of Eagles series and The Camulod Chronicles, Scottish born Whyte imagines the early life of one of his homeland’s greatest heroes. The author conducted in-depth research into his subject, even traveling throughout Scotland on a fact-finding mission. Unfortunately little documentation remains of the freedom fighter’s life before his stunning victory against the English at Stirling Bridge in 1297. 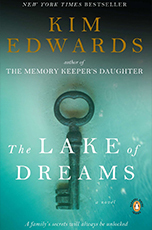 However, this absence of fact is fertile ground for the mind of an historical novelist, and the writer fills the void with very interesting and well-developed characters. The first third of the book, arguably the most engrossing portion, tells of the Wallace boys’ early childhood and entry into young adulthood. James and William grow up together, and after their family is brutally slaughtered by a rogue group of soldiers, they are raised by a Welsh bowman named Ewan Scrymgeour. The archer is a huge hulk of a man with a frighteningly mutilated face caused by an accident in his youth. Though he is outwardly scary, Scrymgeour proves to be a loyal friend to the Wallace family, and emerges as one of the book’s most likable characters. He teaches the boys how to handle a bow and a quarterstaff, as supplements to their academic education from the nearby abbey. Like Scrymgeour, the boy William grows to love the longbow, and develops a talent he will use throughout his life. The paths of the cousins begin to diverge as their interests draw then to different vocations. As James delves deeper into intellectual and religious pursuits, he finds his cousin’s lack of imagination and inability to see life in shades of gray rather puzzling. “I know that Will saw life, particularly in later years, in black and white: bad and good, darkness and light, perfidy and honor,” the priest reflects. Events in the last third of the book unfold gradually. The cousins are united again, as Father James is assigned to minister to the growing flock in Selkirk Forest. Though, most of the action and turmoil of the invaded Scotland is conveyed by forest visitors in a series of fireside chats. Many historical figures and political maneuverings on both sides of the border are discussed at length, which will please anyone with a passion for history. However, too much time is spent ruminating on the significance of the rise of the burgesses, wealthy merchants with allegiance to no singular lord, and the fragility of the feudal system. These factors no doubt have a serious effect on the political and economic future of Scotland, but it seems as though some of these conversations could have been consolidated in order to avoid repetition and move the narrative along. It is the brutal personal tragedy at the story’s climax that finally galvanizes William into swift, steely action. Glimmers of the man who is to become a Guardian of Scotland begin to appear. Strangely, the book does not end with the event that William Wallace is renown for, the surprise Stirling Bridge victory. The battle is alluded to briefly in the closing paragraph, but the novel closes with the man on the brink of his destiny, ready to wreak a revenge that will echo through out history. There are two more volumes to be written in this trilogy, featuring Robert the Bruce and Sir James (the Black) Douglas, so it is likely the battle will be addressed later in the series. Whyte does well in creating a sympathetic hero, whose passion, anger and sense of righteousness make him all the more real. The Forest Laird is rich in character and historical detail, yet it tells only part of the story. Rather than A Tale of William Wallace, it is more accurately just the first chapters of his remarkable life.